Clean, private, wifi, dstv, fridge, microwave, central, ideal for business people, meals or self cater. Enjoy your overnight stay in luxury accommodation catering for both the business traveller and tourist. Northcliff Bed and Breakfast offers privacy, security and comfort. Breakfast cereal, beverages etc are provided in your room and a breakfast/lunch pack is included in the rate so that you can get up and go in the morning when it suits you. Meals are also on offer which you can buy as needed. Northcliff Bed and Breakfast offers tourists and business travellers a home from home experience. Wi-Fi facilities keep you in touch with the office and family at all times and you have a full DSTV package in all rooms. When business is done relax on your private patio with view of a lovely garden. Should you wish to braai in the evenings we will light up a fire. The balance is due upon arrival. Rooms are serviced daily. Packed breakfast and lunches as well as dinners may be arranged. Laundry services are available. Early check-in or late check-out time can be arranged. Very hospitable, cosy place to stay. 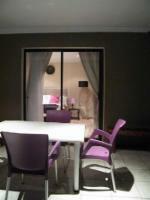 Loved the room with a private entrance and outdoor eating area. Breakfast was delicious, in a small but comfortable and beautifully decorated dining area. There were ants on the room floor and on the ceiling trusses hence floor was grainy and not as clean. Northcliff Bed and Breakfast is 8.9km from the centre of Johannesburg , the nearest airport 22km (Lanseria International Airport).